Slack, the massively popular file sharing and messaging platform, is changing communications and discovery as we know them. That's because Slack, and similar tools, are fastly supplementing, if not replacing, email and discrete documents. Yet legal teams are used to documents, not chat rooms. Join this webinar for a dive into how Slack is changing communications and discovery--and how you can take advantage of this new source of data. Legal technology provides clear benefits to legal teams of all sizes and is critical to running and managing an highly efficient legal department. What’s often not so clear is how to convey this message to internal stakeholders and build consensus around the need for a solution. Today, you don’t need an army of first-year associates to have a powerful legal practice. You just need the right tools. This change has allowed savvy legal professionals to scale their practices in ways previously not possible, and to win the business of large corporate clients in the process. In this webinar, you’ll get insider tips from both mid-sized firms who are making themselves enticing to big-sized business clients and the corporate buyers who are selecting outside representation. Following the 2015 amendments to the Federal Rules of Civil Procedure, the amount of cases involving spoliation sanctions has plummeted. Today, cases involving discovery sanctions are only one third as common as they were during their peak in 2011 and 2012. Are we seeing the end of sanctions? And if so, what effects is this having on the legal practice? 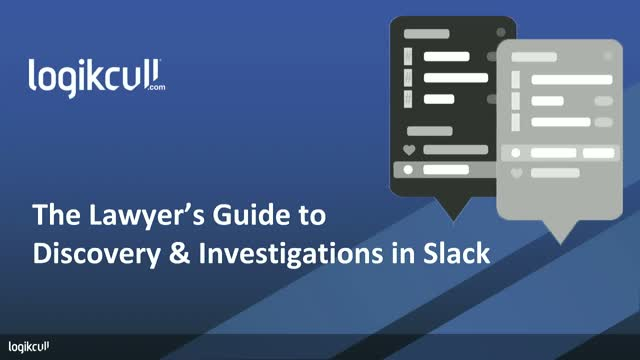 Join Logikcull and eDiscovery experts Craig Ball and Mira Edelman as we explore these topics, including a review of extensive new research on eDiscovery sanctions post-2015, key case laws, and emerging corporate discovery trends. Craig Ball is a trial lawyer, computer forensic examiner, law professor and noted authority on electronic evidence. Among his many accomplishments, he has served as the Special Master or testifying expert in computer forensics and electronic discovery in some of the most challenging and celebrated cases in the U.S. He is a founder of the Georgetown University Law Center E-Discovery Training Academy and regularly teaches eDiscovery and digital evidence at the University of Texas School of Law. Mira Edelman has decades of experience in discovery, both as in-house counsel and in private practice. She has worked as Associate General Counsel and Director of eDiscovery Services and Information Governance for Facebook, Senior Counsel and Discovery manager for Google, and eDiscovery Counsel at Hughes Hubbard & Reed. Mira is also a frequent writer and speaker on issues such as sanctions, legal holds, and ESI. Today’s in-house counsel are changing the practice of law. GCs and CLOs are leading the charge to implement new legal technology, to bring new efficiencies to the legal process, and to, simply, do more with less. Meanwhile growing in-house expertise and autonomy are changing the dynamic with outside counsel, as corporate clients demand to be treated not as advisees, but as partners. If you want their business, you’ll need to keep them happy. We want to help you do that. Join us for our upcoming webinar featuring Robert Schlossman, Chief Legal Officer at Zscaler, and Laszlo Kupan, General Counsel at J.D. Power, as we explore the 10 things corporate counsel hate—and how to avoid them. Robert Schlossman, Chief Legal Officer at Zscaler, has been a key legal and business advisor to CEOs, management teams, and boards of directors of public, private equity, and venture capital backed companies. Robert develops legal departments into organizations that both protect a company and enable the success of the business. He has substantial experience with streamlining legal operations, optimizing legal budgets, creating and managing compliance programs, IP strategy, contracts, litigation, and more. Laszlo Kupan is General Counsel at J.D. Power, one of the leading marketing information services companies, where he works to help the company realize both its business and legal objectives. Prior to joining J.D. Power, Laszlo worked as senior counsel for Live Nation and General Counsel for Access Integrated Healthcare. By design, General Counsel of emerging legal departments wear so many hats it can be overwhelming. They are tasked with not only managing the internal and external legal matters impacting their companies, but they also need to stay on top of industry-related business trends and legal developments. With all of that responsibility, who has time to stay on top advances in legal technology and innovation? On December 5, Evolve the Law, Above the Law’s Legal Innovation Center (ETL), held its inaugural Roundtable, “Emerging Legal Departments: Legal Tech 101”, at the San Francisco headquarters of ETL member, Logikcull. Leading the Roundtable were industry innovators, Monica Zent, Founder of the innovative alternative legal solutions provider, ZentLaw & Founder and CEO of Foxwordy, the patented AI-powered collaboration platform for the legal industry and Stephanie Corey, Co-Founder of UpLevel Ops, a legal strategy and operations consulting firm. Designed for general counsel of emerging legal departments, legal ops professionals and legal tech solution providers, the Roundtable focused on how law departments can on-board legal technology and the preparation, questions, options and solutions that must be considered in doing so. In modern legal practice, the difference between failure and success can often turn on data. Yet after nearly two decades of eDiscovery case law and two related sets of revisions to the Federal Code of Civil Procedure, the bench and bar still grapple with how best to handle data in litigation, as the most important cases of the past year show. From discovery processes gone wrong and new sources of sanctions, from anonymous messaging platforms to claims of discovery malpractice, the past year’s cases are a reminder that discovery remains as critical, and sometimes as risky, as ever. Join Judge Thomas I. Vanaskie of the U.S. Court of Appeals for the Third Circuit and a panel of attorney experts for an upcoming webinar surveying these cases and more. Judge Vanaskie was appointed to the Third Circuit Court in 2010, having served at the federal district court level in Scranton for 16 years prior. Over the course of his two decades on the bench, technology has dramatically reshaped how litigation is waged and disputes resolved. But Vanaskie has spearheaded efforts to keep the justice system up to speed. In 2005, he was selected by Chief Justice William Rehnquist to head the Information Technology Committee of the U.S. Judicial Conference, the policy making body for federal courts, a role he served until 2008. Judge Vanaskie may be best known in legal technology circles for authoring what is perhaps the most influential decision on the recovery of electronic discovery costs, Race Tires America. In the eyes of cybercriminals, legal professionals are an easy—and lucrative—target. Law firms are often a one-stop shop for incredibly sensitive information and you might not be doing enough to protect the data in your possession. So if a breach occurs, what potential ethics violations may result? Join us for an upcoming webinar as we delve into this question. A frequent author and speaker on ethics and professional responsibility, his work has appeared in leading journals such as the Fordham, Stanford, University of Colorado and Wisconsin law reviews, and the Georgetown Journal of Legal Ethics. Eli’s articles have also been cited in ABA ethics opinions and excerpted in legal ethics casebooks. Join a panel of experts as they identify some of the most common underhanded eDiscovery tricks and teach you what you can do to defeat them. Document dumps, questionable denials of custody and control, meritless objections—when it comes to eDiscovery, your opposing counsel may have a few dirty tricks up his sleeve. Brian Wolfinger: Chief Technology Officer at Everest Technologies, Brian Wolfinger has decades of experience in the worlds of digital forensics and electronic discovery, as founder of Wolfinger Forensics, former CISO and VP of Technology at LDiscovery, and Manager of the Emergency Response Services at ISS. Rebecca Rakoski: Rebecca Rakoski is the co-founder and managing partner at XPAN Law Group, a boutique law firm focusing exclusively on cybersecurity and data privacy. She is an expert on the intersection of technology and legal obligations and liabilities and has extensive experience in cybersecurity standards and guidelines. Moneet Kohli: An attorney and seasoned eDiscovery expert, Moneet Kohli helps legal professionals implement, manage, and simplify eDiscovery, as Senior Customer Success Manager at Logikcull. In the past, Moneet managed eDiscovery projects at multiple AmLaw 100 firms and corporations throughout the United States. She also serves as San Francisco's Chapter Director of Women in eDiscovery. Michael Simon: Michael Simon is an attorney and consultant with over 15 years of experience in the eDiscovery industry, during which he’s seen more than his fair share of dirty tricks. Principal at Seventh Samurai and adjunct professor of law, he regularly writes and presents on pressing eDiscovery issues throughout the country. The amount of data available to legal professionals is expanding at a mind-boggling pace. Over 2.5 exabytes, or 75 trillion pages’ worth, of data is generated every day. And much of it isn’t the email inboxes and Office documents attorneys are used to dealing with. From chat messages, to IoT data, to ephemeral communications, tomorrow’s case-dispositive data can take nearly any shape. -- Mobile data: Does BYOD, BYOA and BOYC all add up to Bring Your Own Nightmare? It’s an educational, action- and acronym-packed hour you don’t want to miss. Law firms are increasingly a high-value target for hackers, a “one stop shop” for sensitive data. And as dozen of examples show, the hackers are often successful. How do these cybercriminals infiltrate law firms and what can be done to prevent them? Join our panel of experts as they dissect the anatomy of a successful law firm cyberattack and explain how you can protect yourself, and your clients, from a similar fate. - Jake Bernstein: An attorney with Newman Du Wors, Jake Bernstein’s practice focuses on counseling clients on cybersecurity issues. A former Washington State Assistant Attorney General and a frequent speaker and advisor on cybersecurity legal issues, Bernstein has significant experience with regulatory compliance, privacy, and cybersecurity law. - Eli Wald: A professor of legal ethics at the University of Denver’s Sturm College of Law, Eli Wald was one of the first academics to investigate the ethical implications of law firm cybersecurity. A frequent author and speaker on ethics and professional responsibility, his work has been cited in ABA ethics opinions and excerpted in legal ethics casebooks. - Kip Boyle: A 20-year information security expert and founder of Cyber Risk Opportunities, Kip Boyle advises global companies in the logistics, technology and financial services industries. He is a nationally recognized analyst, lecturer and thought-leader in cyber risks and has been featured in Entrepreneur magazine, Chief Executive magazine and others. Government organizations have struggled in recent years to promptly respond to open records requests amid a surge in volume and general explosion in information. Now consider the increased public interest in government affairs created by the current political regime -- and the fact that it's an election year. What can forward-thinking but resource-strapped agencies do to keep pace with the avalanche of public records? Join David Billetdeaux, in-house counsel at the Port of Benton, for best practices around how to improve response throughput on a budget. This program is a must-attend for government attorneys, records officers, paralegals, and others tasked with navigating records response. It may be the greatest unsolved mystery in the legal practice: the case of the missing 502(d) order. These orders can act as a strong shield against the waiver of privilege or protection when information is inadvertently produced during litigation—providing much more protection than a clawback agreement alone. Yet observe the typical courtroom today and such orders will almost never be found. Why? Join Judge Andrew J. Peck as he discusses the potential benefits of 502(d) orders, why and how to use them, and why so many lawyers are failing to fully protect client information during litigation. Judge Andrew J. Peck has been a leading name in eDiscovery since 1995, when he was first appointed Magistrate Judge for the Southern District of New York. Just a few months after taking the bench, shortly after O.J. Simpson’s trial concluded and Windows 95 was released, Judge Peck issued a key eDiscovery opinion, ruling that companies must make electronic versions of their computerized data available during discovery. In the years that followed, Judge Peck penned several widely influential opinions, from the first opinion approving the use of predictive coding in Da Silva Moore v. Publicis Groupe to a recent warning to the bar over boilerplate discovery objections in Fischer v. Forrest. Judge Peck retired from the bench in March and now serves as senior counsel at DLA Piper. We’re in the midst of a golden age of evidence, with rapid data growth, from electronic documents to emails to social media, creating an ever-expanding universe of information potentially relevant to litigation. Yet legal practitioners and courts are still grappling with the consequences of this massive growth in digital evidence. How can parties ensure that the time and expense dedicated to discovery is proportional to the needs of the case? How should judges deal with practitioners who fail to adapt their past discovery strategies to new federal rules? When and how should courts sanction practitioners whose failure or refusal to handle digital evidence properly impedes the administration of justice? Join a panel of experts, including celebrated U.S. Magistrate Judge James C. Francis IV (Ret. ), as we examine these questions through a survey of the most important cases of 2018 so far. U.S. Magistrate Judge James C. Francis IV (Ret.) served in the Southern District of New York from 1985 to 2017 and as Chief Magistrate Judge from 1998 to 2000. With over more than 30 years on the bench, Judge Francis has seen discovery evolve from associates sifting through stacks of paper to sophisticated systems culling vast amounts of data. A widely recognized expert on eDiscovery, he has helped shape that evolution along the way. Gareth Evans is a litigation partner at Gibson, Dunn & Crutcher LLP, with 25 years of experience at the firm, where he is one of the founders and co-chairs of Gibson Dunn’s Electronic Discovery Practice Group and is one of the lead authors and editors of Gibson Dunn’s highly acclaimed eDiscovery Year-End and Mid-Year Reports. Michael Simon is an attorney and consultant with over 15 years of experience in the eDiscovery industry. A self-described “nerd turned lawyer turned nerd,” he is Principal at Seventh Samurai and a frequent author and speaker on pressing eDiscovery issues. When it comes to eDiscovery, how can you ensure that you're finding what you're looking for? It starts with search accuracy. If your search is faulty, then your entire case could be at risk. Indeed, unreliable searches could hurt your entire career, exposing you to potential sanctions, spoliation, and shame. In discovery, guaranteeing accurate, reliable searches should be a top priority. But often, legal professionals don’t realize what they’re missing, or how their approach to discovery, from their eDiscovery software to query construction, can impact the evidence available to them. Join us for this must-see webinar on search accuracy featuring Craig Ball, a trial lawyer, computer forensic examiner, law professor and noted authority on electronic evidence. Craig Ball is a noted authority on electronic evidence. He limits his practice to serving as a court-appointed special master and consultant in computer forensics and electronic discovery and has served as the Special Master or testifying expert in computer forensics and electronic discovery in some of the most challenging and celebrated cases in the U.S. He is a founder of the Georgetown University Law Center E-Discovery Training Academy and teaches Electronic Discovery and Digital Evidence at the University of Texas School of Law. You can find his articles on eDiscovery and computer forensics on his website, www.craigball.com, and his blog, www.ballinyourcourt.com. An application requesting MCLE credit for this activity is pending for approval by the State Bar of California. Whether you’re hanging your own shingle, moving to a paperless practice, or just looking to modernize your firm, the tools you need to succeed as a legal professional are increasingly in the cloud. And that’s good news. As the BigLaw model faces a decade of stagnation, the cloud is allowing innovative lawyers to level the playing field without costly investments in infrastructure, to take on new opportunities, and gain an advantage over their more flat-footed competitors. Join this webinar to learn how cloud-based technology can help you build a practice that runs smoothly, efficiently, and successfully, cutting back on the drudgery and allowing you to focus on the work that most matters. Michael Chasin is the CEO and co-founder of Lexicata as well as one other legal tech company, LawKick. He was born and raised in Los Angeles but went to college in both Barcelona, Spain and Chapel Hill, North Carolina. He returned back to Los Angeles to complete his JD & MBA Degrees from Loyola Marymount University. Casey Sullivan is an attorney in San Francisco, who leads thought leadership and consumer education efforts at Logikcull. eDiscovery can be expensive, risky, complex—and expensive again. For companies dealing with massive amounts of data in litigation, it’s not unusual to see budgets quickly overwhelmed by burdensome discovery requirements, endless vendor bills, and outside counsel who fail to make efficiency a concern, let alone a priority. But it doesn’t have to be this way. A comprehensive corporate eDiscovery program can reduce discovery costs by tens of millions of dollars—or more. Join us for this upcoming webinar featuring experts who have saved companies millions. Wayne Matus, Matus Consulting Group LLC: Wayne Matus is a litigation partner & managing director with extensive experience in litigation, investigations and compliance, adept at solving eDiscovery, privacy & data related problems for organizations large & small. Prior to launching Matus Consulting Group LLC, Wayne revolutionized the eDiscovery process at UBS, reducing eDiscovery costs by tens of milions of dollars. Bill McManus, Partner at Cosmich Simmons & Brown. Bill is an experienced litigator & corporate counsel with specialized expertise in eDiscovery, information management, & more. Bill’s practice focused on utilizing dedicated teams of attorneys & leveraging technology to streamline legal processes with predictable pricing & predictable & defensible outcomes. Ron Sotak, Director of e-Discovery at Cosmich, Simmons & Brown, where manages a specialized team of document review attorneys within the firm’s Strategic Business Solutions practice group. Ron has worked with Corporate & merits counsel to develop custom workflows utilizing state-of-the-art technologies in hundreds of document review projects. Blockchain technology is promising to remake institutions and industries throughout the world. Companies are looking to integrate blockchain into their business models, while technologists are investigating how it may change everything from international financial institutions to simple contracts. At the same time, government regulators are just beginning to pay attention to blockchain-based technologies. More and more legal professionals, too, are becoming familiar with blockchain, whether in advising clients on the legal implications of potential blockchain initiatives, dealing with an evolving regulatory landscape, or handling disputes involving blockchain-based technologies and assets. Antigone Peyton leads the Intellectual Property and Technology Law practice at Protorae Law, where she focuses on intellectual property litigation and IP portfolio management and growth strategies involving patents, trademarks, trade secrets, and copyrights. Her litigation and counseling practices also include technology law issues involving social media, IoT, cybersecurity, blockchain, and cloud computing. Erica G. Wilson is an associate with Vuono & Gray, where she is representing individuals and businesses in civil cases, such as disputes over employment contracts, commercial leases, confessions of judgment, partnership agreements, and, yes, blockchain. A cryptocurrency and blockchain enthusiast, Erica regularly speaks to bar associations and professional groups about the legal implications of such technology and is proud to count herself as one of the only 802 people to report bitcoin-related gains to the IRS. Logikcull.com is instant discovery for modern legal teams. Its secure, cloud-based solution helps law firms and organizations of all sizes solve the expensive, complex, and risky challenges associated with eDiscovery, internal investigations, and open records response. With Logikcull, you can start a discovery project in five seconds, from anywhere at any time on any device. Reviewing data is as easy as performing a Google search. And in Logikcull, your data is always secure. That’s why it’s trusted by the Fortune 500, Am Law 200, and governments of the biggest cities in the world. Founded in 2004 by CEO Andy Wilson and CTO Sheng Yang, Logikcull builds powerfully simple software that democratizes discovery.